Actual Size: Length 18'4' Width 15'7" Height 11'2"
This Military Truck Bounce House is sure to be a hit as your children will enjoy the large interior jumping area (200 Square feet) in this unique bounce house. Parents and spectators are offered a clear view with the 360-degree mesh sides. 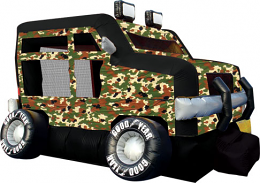 This Inflatable Military Truck bounce house is available for rent in Lafayette, Youngsville, Rayne, Scott, and surrounding areas. Got Bounce? The Bouncing Buddies Military Truck Bounce House is great for family entertainment, providing the most popular form of amusement for children. Bouncing also puts you in a state of health and fitness, improves your sense of balance, creates an aerobic effect for your heart, strengthens your muscles, and increases the capacity for respiration, resulting in better mental performance!